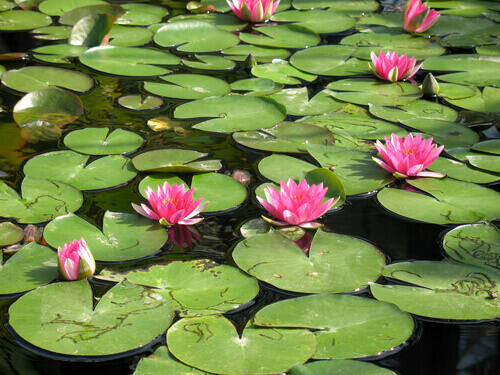 Home > Blog > Aquatic Plants > Get To Know The Most Popular Aquatic Plants For Ponds! A pond without plants is not really a pond… doesn’t it just feel like a big puddle of water? In addition to the aesthetic appeal, adding popular aquatic plants will provide many other benefits, including the elimination of harmful organics, oxygenating the environment and a place for fish to hide and shield them from sunlight. However, to get the most out of your plants you must know how to select and care for them. The majority of these plants is sold in barerooted form, and will range in size from 7 cm to 1 liter dependent on how fast they grow and the season. The aquatic plants feed heavily so plant food should be plentiful. Lotus plants display a tropical look but may also be categorized as perennials, which are known for their hardiness. They grow very well and some of the most popular variants are Chawan Basu and Momo Botan. When shipped they will arrive as tubers. Marginal plants thrive in soil which is partially covered by a small amount of water. They will eventually show up on the surface of the water near the pond’s edge. This is a type of plant which performs best in soil that is moist. They are usually located near a pond’s edges, in water which is shallow. Their roots will be submerged and when they grow the flora will appear above it. Bog plants are usually shipped in miniature pots, and can be submerged at depths of as much as 2 inches. They are perfect for small streams and some of the most popular variants include Dwarf Cattails and Water Poppies. Water Lilies are arguably the most popular plants to be added to ponds. There are many good reasons for this. They come in both hardy and tropical variants, and are quite beautiful. They can thrive in multiple zones and some of the most popular variants include Peach Glow, Colorata and Sioux. These plants are extremely important as they are responsible for maintaining clean water. They block the growth of algae while providing the pond with oxygen. When shipped they will arrive in pots which are about a gallon in size, and when installed they should be submerged a minimum of twelve inches. Some of the most popular variants of submerged aquatic plants include Anacharis and Hornworth. As the name suggests, floating plants grow near the surface of the pond water, and appear to “float.” It isn’t necessary to plant them as their roots will not develop within the soil. All that is needed is to put them on the surface of the pond water. The most popular floating plants are Water Hyacinths and Parrot’s Feather. Adding plants to your pond will make it more beautiful and more vibrant. It will attract animals while giving your fish a place to hide. There are many varieties to choose from and by learning the characteristics of each you will make the best purchasing decisions for your climate. While you add aquatic plants to your pond, you should not forget to perform pond maintenance so that your pond can always be a healthy environment for your pond habitants to thrive in.